A Lake Shasta houseboat vacation is a favorite of many people in Northern California and Southern Oregon. It's a fun option for both large family vacations and lazy, quiet getaways with a group of friends. The Lake Shasta houseboat experience is relaxing. You won't have much to do all day but swim, cruise around exploring the lake's many coves, read, play games, or take a nap. That may sound like torture to anyone who likes to be on the go all the time, but it's a nice change of pace if you want to slow down for a while. Anytime is nice to be out in Lake Shasta, but the area is busiest June through August. The weather is best in September. For smooth water and fewer people, go in December or January. A houseboat also makes a nice place for a Thanksgiving weekend retreat. You can rent houseboats at Lake Shasta that have room for as few as six and as many as 19 people. If that sounds like a lot of folks to pack into a small space, you're right. You get a little more room on models with a roof deck, where people can hang out. Some people like to sleep up there, too. Nevertheless, it's best to take your Lake Shasta houseboat vacation only with people you can get along within close quarters. Your houseboat will be equipped with all the basics for cooking and eating. It will have an electric generator, a heater and maybe an air conditioner, and bathrooms with toilets and showers. Larger houseboats may have more amenities that may include swim platforms, slides, rooftop sundecks (some with hot tubs), satellite TV and satellite radio, private bedrooms, and even fake fireplaces. When you tie up for the night, you can have a bonfire on shore at Lake Shasta, but you'll need a permit for it, which you can get when you rent your boat. If you're worried about safety, you might fall overboard, but a houseboat is supposedly almost impossible to sink. 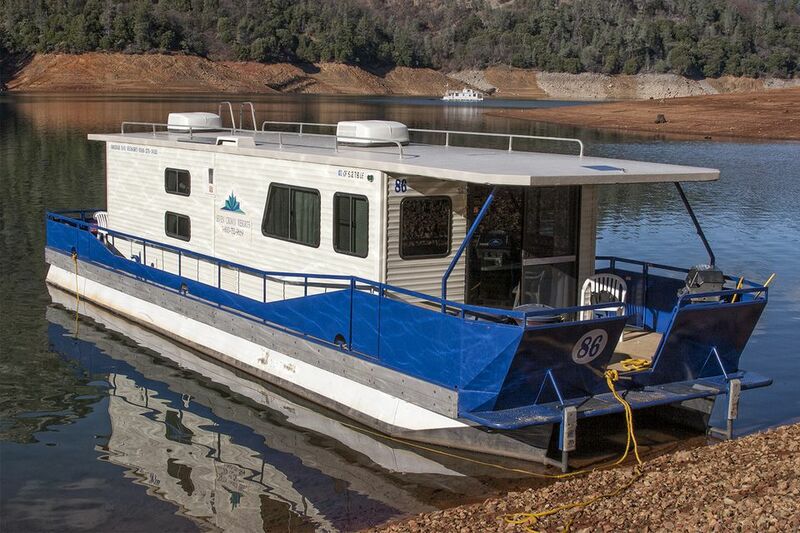 At first glance, a Lake Shasta houseboat rental may seem very expensive. Don't dismiss the idea before you think it through, though. Calculate the cost per person (or family) per night, taking into account that you will be cooking rather than eating out. Rental rates vary by season, boat size and amenities. You'll pay the highest rates from Memorial Day through August, mid-level rates in September and less the rest of the year. The fuel tank will be full when you pick up your boat. Fuel fill-ups are not included in the rental prices, but you need to include them in your total budget. They vary by size of the boat, how much you use the engine and local cost per gallon. Ask your rental company how much people normally spend in their area. Quoted rental rates do not include taxes. Expect to pay a deposit of several hundred dollars when you make a reservation, along with an extra damage deposit that will be hundreds of dollars and more than a thousand for larger, newer boats. The full rental fee will be due a month or two before your trip, and you may be required to cancel at least 30 days in advance, or you'll forfeit it all. These companies offer houseboat rentals on Lake Shasta. Each of them will have the basic boats, but the details vary. Use the list above to do your research and find your perfect houseboat. First, know how many people will be using the houseboat and what kind of sleeping accommodations you need. A group of six singles who each want a private sleeping area may need a larger boat than a family of 10 people who are willing to share bedrooms. Discuss amenities with your traveling companions, and after a quick look at what's available set a daily budget that includes not only rental fees but also fuel and food.